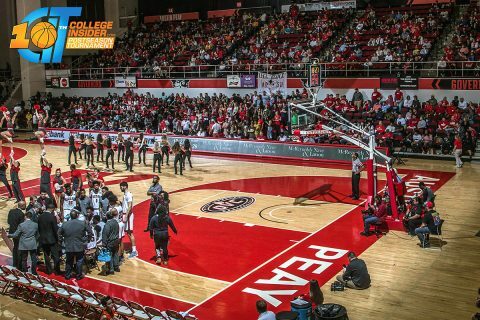 Clarksville, TN – Thanks to some local benefactors, all Austin Peay State University students, as well as local military, will receive free admission to next Wednesday’s CollegeInsider.com Tournament quarterfinal contest in the Dunn Center. Thanks to the generosity of Jenkins and Wynne of Clarksville, all active duty military members will receive a complimentary ticket to Wednesday’s game, which tips at 7:00pm against an opponent to be determined. Meanwhile, the kindness of Echo Power Engineering, LLC, will provide free tickets for all students with current university ID. For everyone else, tickets are $20.00 for reserved seating, $15.00 for general admission and $10.00 for kids (ages 3-12). Tickets can be purchased immediately by visiting www.LetsGoPeay.com/SportTix or calling 931.221.PEAY.